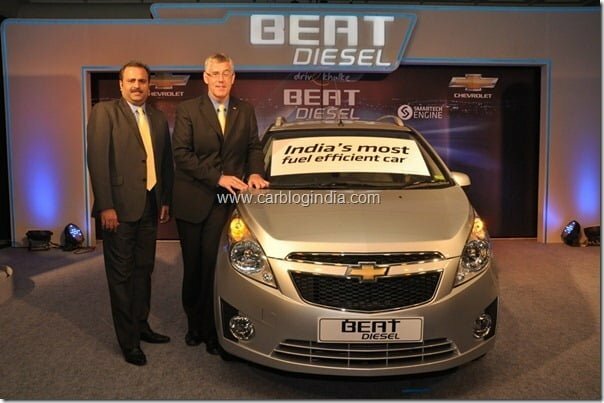 With a highly fuel efficient diesel engine, Chevrolet Beat Diesel seems like a hot choice of small car buyers in India. As the the latest official sales reports from General Motors / Chevrolet India, posted a 13% growth in sales in the month of March 2012 in India selling 10, 588 cars compared to the previous sales number of 5638 units in March 2011. More than 50% of the sales came from Chevrolet Beat small car which in its diesel variant, delivers a mileage of close to 24 KMPL with agile torque delivery. About 20% of the sales came from popular MPV Chevrolet Tavera which sold over 2000 units after its re-launch with a BS4 emissions compliant CRDI Diesel Engine. While the Beat recorded its highest sales since its launch, the Tavera crossed the 2,000 mark again after 5 years. The March 2012 sales comprised of 5638 units of Beat, 2075 units of Tavera, 107 units of Chevrolet Aveo, 123 units of Chevrolet Optra, 44 units of Chevrolet Captiva, 722 units of Chevrolet Cruze and 1879 units of small car Chevrolet Spark. General Motors will be quite aggressive in India in coming some years as it already has a lots of launched lined up in India. The Chevrolet Captiva 2012 is scheduled for launch in April 2012, while the Chevrolet Sail premium hatchback is expected to launched in June 2012. The Chevrolet Enjoy MPV and Chevrolet Sail Sedan is also lined up for launch in India by end of 2012. For latest updates, stay tuned to us by signing up for our free email newsletter and like our official Facebook Page.